This is a private web-page begun when the Author was on the Staff of the School and is being maintained as a genealogical service. Most of the materials used have now been donated by the Governors of the School to the Lincoln County Archives Office and are used here with the permission of the Governors. Admissions book – draft copies under construction. Beginning at pupil 214 in 1883 and including portraits from Sports Photographs, census material. Unfortunately, before the Archive collection was rescued the volume came apart in a desk and the names and details of the first 213 students from 1863 to 1883 disappeared and have been utterly lost. The volume has now been rebound by the school, is deposited in Lincoln Archives Office and contains names from 1883 to the 1970s. A reference cannot yet be given as the deposit was made after this site was begun, and I’ve not caught up with their cataloging yet! Indexed photographs of School Football, Cricket, and Rugby Teams 1885-1945, (originals now in Lincoln Archives). The collection is fully name indexed between 1885 and 1945 – although pictures have only been scanned up to about 1919. There are also a growing number of more recent photographs and site pictures. There are also some pictures of the School and Rasen Town taken by Mr Mal Jones. Recent pictures of John Edward Tillett donated by a great great nephew, Mr T. Thornhill, of Australia. Fines for misbehaviour 1868 – 1870. This is the earliest extant list of names. Spreadsheet. Preliminary draft of school memories of Robert Sullivan, 1920-1928. Illustrated/Edited. Un-indexed Honour Board photographs, lists of Headmasters of De Aston and Market Rasen Modern School. Three photographs showing the 1990s renovation of the Boarding House Dormitories. Two photographs of other Rasen Schools: Market Rasen Modern School Staff – brought from the Market Rasen Modern School when schools merged in the 1970s and the Wesleyan School that preceded it, about 1910. The owner of the picture, Mark Lockwood, would dearly like to identify anyone at all – comments will be passed on. Brief staff details 1901-1963 - source volume now in Lincoln Archives. 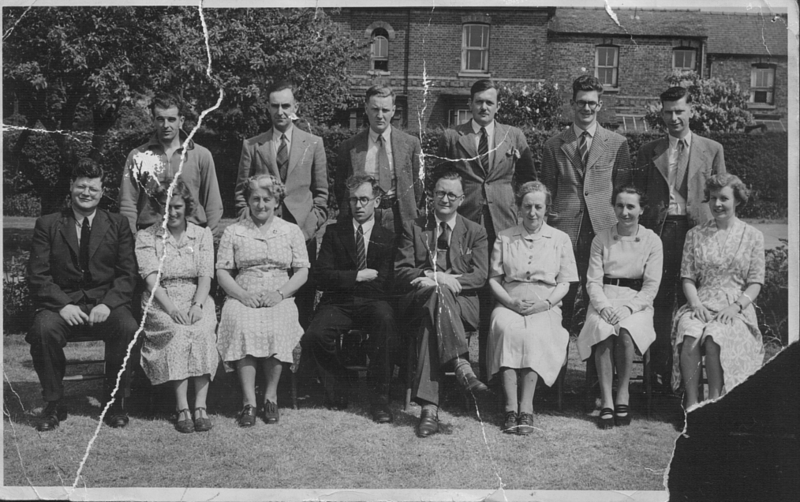 The Staff in 1948, taken from a copy of the De Astonian Magazine. Prints and photographs of the Hospital of Thomas De Aston at Spital on the Street, Lincolnshire. 1863 Roof Timbers in “Big School” photographed before renovation – now part of a Boarding House dormitory. Mr K J Norman, late of the History Department. His own web-page has mainly genealogical material.